The United States District Court for the Eastern District of Pennsylvania (in case citations, E.D. Pa.) is one of the original 13 federal judiciary districts created by the Judiciary Act of 1789. It originally sat in Independence Hall in Philadelphia as the United States District Court for the District of Pennsylvania, and is now located at the James Byrne Courthouse at 601 Market Street in Philadelphia. There are Eastern District federal courtrooms in Philadelphia, Allentown, Reading, and Easton. 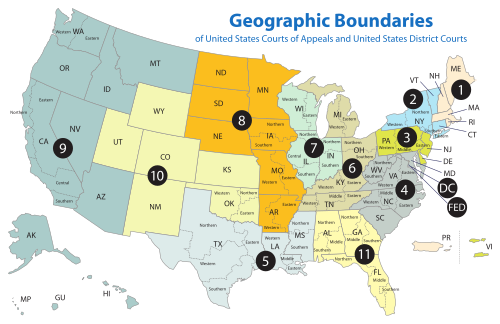 The Court's jurisdiction includes Philadelphia, as well as Berks, Bucks, Chester, Delaware, Lancaster, Lehigh, Montgomery and Northampton counties. The district is a part of the Third Circuit, and appeals are taken to that Circuit (except for patent claims and claims against the U.S. government under the Tucker Act, which are appealed to the Federal Circuit). The current Chief Judge for the Eastern Pennsylvania District Court is Judge Juan Ramon Sanchez. The people in the district are represented by the United States Attorney for the Eastern District of Pennsylvania, currently William M. McSwain. The United States District Court for the District of Pennsylvania was one of the original 13 courts established by the Judiciary Act of 1789, 1 Stat. 73, on September 24, 1789. It was subdivided on April 20, 1818, by 3 Stat. 462, into the Eastern and Western Districts to be headquartered in Philadelphia and Pittsburgh, respectively. Portions of these districts were subsequently subdivided into the Middle District on March 2, 1901, by 31 Stat. 880. At the time of its initial subdivision, presiding judge Richard Peters Jr. was reassigned to only the Eastern District. 7 John Bayard McPherson PA 1846–1919 1899–1912 — — McKinley appointment to 3d Cir. 9 Joseph Whitaker Thompson PA 1861–1946 1912–1931 — — Taft appointment to 3d Cir. 14 Albert Branson Maris PA 1893–1989 1936–1938 — — F. Roosevelt appointment to 3d Cir. 15 Harry Ellis Kalodner PA 1896–1977 1938–1946 — — F. Roosevelt appointment to 3d Cir. 17 James Cullen Ganey PA 1899–1972 1940–1961 1958–1961 — F. Roosevelt appointment to 3d Cir. 23 Francis Lund Van Dusen PA 1912–1993 1955–1967 — — Eisenhower appointment to 3d Cir. 28 Abraham Lincoln Freedman PA 1904–1971 1961–1964 — — Kennedy appointment to 3d Cir. 31 A. Leon Higginbotham Jr. PA 1928–1998 1964–1977 — — L. Johnson appointment to 3d Cir. 38 Edward Roy Becker PA 1933–2006 1970–1982 — — Nixon appointment to 3d Cir. 56 Anthony Joseph Scirica PA 1940–present 1984–1987 — — Reagan appointment to 3d Cir. 60 Franklin Van Antwerpen PA 1941–2016 1987–2004 — — Reagan appointment to 3d Cir. 73 Midge Rendell PA 1947–present 1994–1997 — — Clinton appointment to 3d Cir. 93 Luis Felipe Restrepo PA 1959–present 2013–2016 — — Obama appointment to 3d Cir. Chief judges have administrative responsibilities with respect to their district court. Unlike the Supreme Court, where one justice is specifically nominated to be chief, the office of chief judge rotates among the district court judges. To be chief, a judge must have been in active service on the court for at least one year, be under the age of 65, and have not previously served as chief judge. A vacancy is filled by the judge highest in seniority among the group of qualified judges. The chief judge serves for a term of seven years or until age 70, whichever occurs first. The age restrictions are waived if no members of the court would otherwise be qualified for the position. When the office was created in 1948, the chief judge was the longest-serving judge who had not elected to retire on what has since 1958 been known as senior status or declined to serve as chief judge. After August 6, 1959, judges could not become or remain chief after turning 70 years old. The current rules have been in operation since October 1, 1982. ^ a b c Asbury Dickens, A Synoptical Index to the Laws and Treaties of the United States of America (1852), p. 388. ^ a b c U.S. District Courts of Pennsylvania, Legislative history, Federal Judicial Center. ^ Recess appointment; formally nominated on December 11, 1828, confirmed by the United States Senate on February 23, 1829, and received commission on February 23, 1829. ^ Recess appointment; formally nominated on January 5, 1939, confirmed by the United States Senate on March 30, 1939, and received commission on May 4, 1939. ^ Recess appointment; formally nominated on April 4, 1940, confirmed by the United States Senate on April 24, 1940, and received commission on April 29, 1940. ^ Recess appointment; formally nominated on January 5, 1950, confirmed by the United States Senate on March 8, 1950, and received commission on March 9, 1950. ^ Recess appointment; formally nominated on January 5, 1950, confirmed by the United States Senate on April 4, 1950, and received commission on April 7, 1950. ^ Recess appointment; formally nominated on January 12, 1956, confirmed by the United States Senate on March 28, 1956, and received commission on March 29, 1956. ^ a b Recess appointment; formally nominated on February 3, 1964, confirmed by the United States Senate on March 14, 1964, and received commission on March 17, 1964. ^ "Former U.s. Attorney To Represent Preate Edward Dennis Jr. Was Named As Counsel In The Office Investigation. The Bill Goes To Taxpayers. - philly-archives". articles.philly.com. Retrieved December 2, 2015. ^ "History of the Federal Judiciary". fjc.gov. Retrieved December 2, 2015. ^ "Region's U.S. attorney will resign Michael R. Stiles has spent 8 years in the high-profile post. Delco's D.A. is viewed as a possible successor. - philly-archives". articles.philly.com. Retrieved December 2, 2015. ^ "President Obama nominates Zane Memeger to replace Pat Meehan | lehighvalleylive.com". lehighvalleylive.com. Retrieved December 2, 2015. This page was last edited on 15 April 2019, at 07:08 (UTC).